Hungry Jerks - Food Recipes and Restaurant Reviews: What is Pork Roll? I'm not a huge breakfast fan in general, mostly because I don't like getting up early. However, there are a few things that can get me out of bed no matter what, for some people its bacon but for me its all about the Pork Roll. 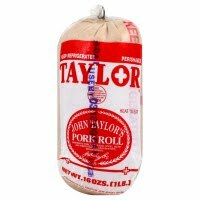 Some people call it Taylor Ham and you can find it in the store as John Taylor's Pork Roll, usually in the deli isle in on of the cases in the middle of the isle that has your more exotic cheeses and salamis. Here in Arizona Pork Roll seems to be lost in the crowd but for us east coast transplants Pork Roll usually made its way into our breakfast once or twice a week. What is it? 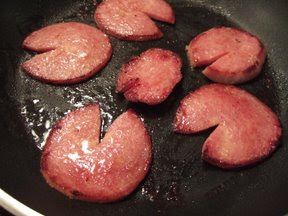 In essence Pork Roll is just a salted pork breakfast meat, Pork roll is generally sold in 1, 1.5, and 3 lb. unsliced rolls packed in cotton bag, as well as 6 oz. boxes containing 4, 6, or 8 slices. Larger rolls and packages are available for food service customers. It has been a staple in public school cafeterias in New Jersey. How to cook it: Now I prefer my Pork Roll to be sliced thin and cooked more on the well done side. However, others prefer thick cuts, its all a matter of personal taste. So I will instead give you user friendly instructions for your first Pork Roll encounters. 1. The Jersey Breakfast - Scrambled eggs and cheese on a long roll with diced Pork Roll. 3. The Baby Bear - two slices of thin cut Pork Roll grilled or fried in a pan, on a hamburger bun with a slice of cheese. 4. The Momma Bear - two slices of thin cut Pork Roll grilled or fried in a pan, on a hamburger bun with a slice of cheese and a fried egg. 5. The Papa Bear - 4 slices of thin cut Pork Roll, pan fried, served on a hamburger roll, on top of a medium cooked hamburger, topped 2 slices of cheese and with a fried egg (yolk still runny).